Bridge2College Programme wins the Irish Learning Technologies Award for Innovation in Learning. The Centre for Research in IT in Education is a collaboration between the School of Education and the School of Computer Science & Statistics. Its research agenda is to explore how technology can be used to enhance teaching & learning and it does so largely through the lenses of constructionism and social constructivism. The close synergy between the two academic disciplines involved is a distinguishing feature of the Centre and allows it to develop tools and pedagogical strategies which benefit from both technological and educational perspectives. A pragmatic action research approach is followed and a guiding principle is that the field of Technology Enhanced Learning needs to move beyond boutique interventions and tackle core issues arising in the transformation of learning in a systemic and sustainable fashion. Bridge21 is the flagship umbrella project of the Centre. 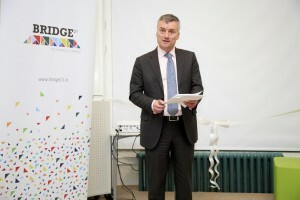 Bridge21 is both a model of “21st century learning” which embodies the use of teamwork and technology and an educational action research project aimed at helping transform Irish Second Level Education. An extensive range of student learning activities are carried out in a purpose designed learning space on campus (in Oriel House) covering a range of topics ranging from digital media literacy, mathematics, computer programming, peer tutoring, history, information age literacy and 2nd language learning. All using the Bridge21 pedagogical model. Over 8,000 students have attended such workshops since late 2007. Bridge21 works closely with schools and teachers to help them adapt the Bridge21 model for use in the mainstream classroom. Teacher professional development workshops are provided both in Oriel House and in schools. Under the umbrella of Trinity Access 21 (TA21) Bridge21 is cooperating closely with Trinity’s Outreach Program (TAP) and the Schools of Education and Computer Science & Statistics to provide a suite of offerings to address educational disadvantage with a particular focus on 21st century learning and STEM. This includes offering a postgraduate certificate in 21st century STEM education for practising teachers and adoption of a set of interventions from the USA NGO College For Every Student to foster a college going culture across the school community. Computational Thinking for Life (CT4L) is a new research focus in 2014, building on expertise and interest in the School of Computer Science and Statistics and in the School of Education. The aim of this research is to establish a better evidence base for teaching and learning where computational thinking is involved, both directly in teaching programming and indirectly when employed across the curriculum. CT4L is focussing research on learning computational thinking, curriculum development and continuing professional development in a variety of education settings. This will support a more measured, evidence­based response to the demand for more teaching of computing, and a clearer definition of the needs of learners at all stages of their life, from early learning and primary to adult learners in informal settings. Computing is still a young and developing discipline and its culture and practices deserve rigorous and robust challenge through technical & pedagogic innovation - we are setting out to create both while further enhancing the knowledge base. This is a part-time course which is strongly influenced by the research activities mentioned above. It is run on a part-time basis over two years and is aimed at those currently active in the use of technology to support learning within all levels of formal education and in the wider area of E-learning. Applications are now invited for the academic year 2015-16. A major new publication on ICT in Irish Schools was launched by Lord Puttnam (Ireland’s Digital Champion) on Weds the 11th of March. Edited by Deirdre Butler, Kevin Marshall and Margret Leahy and titled "Shaping our Future: How the lessons of the past can shape educational transformation” the volume contains several contributions from CRITE personnel. 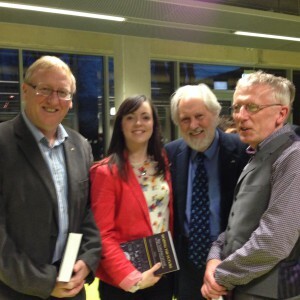 Photo shows Claire Conneely, John Lawlor and Brendan Tangney with Lord Puttnam. Bridge21 is delighted to announce the opening of a new flexible learning space here in Oriel House. In December 2014, the Provost, Patrick Prendergast, officially opened the new space (and cut the ceremonial ribbon). The Provost has been a great supporter of Bridge21 over the years and we are delighted he was able to help us launch this exciting new space. “Bridge22″ is equipped with tables, chairs and storage units built by VS furniture in Germany. There are also several laptop computers and large movable monitors which will allow students and teachers to create, learn and present in several different ways. The movable screen idea was first suggested to us byDigicom and, in fact, they donated to first screen and stand to Bridge21. We are hugely grateful to both VS furniture and Digicom for their support in creating this new learning space. 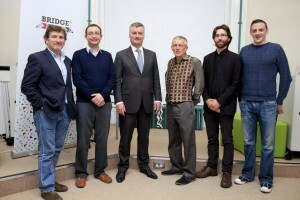 The Provost with the Bridge21 team. 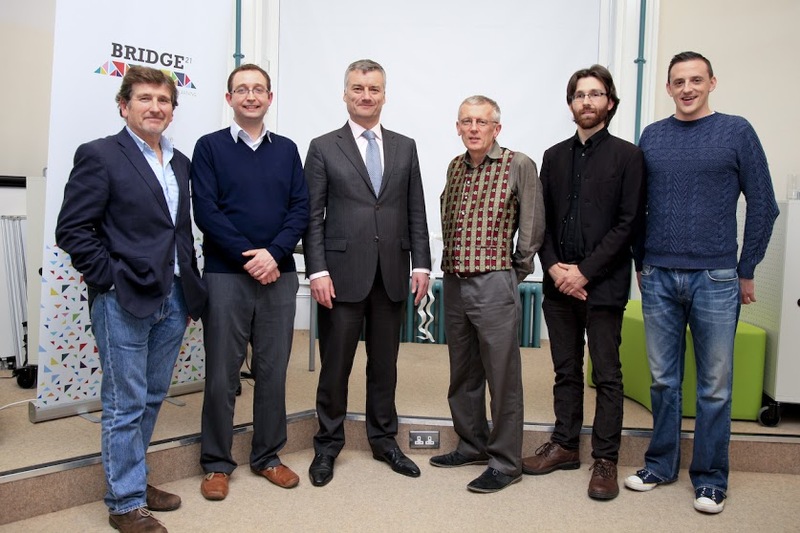 On Friday the 31st May Google announced a major donation to Bridge21 and the Trinity Access Programs. Under the 3 year initiative,which will involve the School of Computer Science & Statistics, the School of Education and the Trinity Access Programs, 1,000 places will be offered to teachers on training courses in the teaching of CS topics (algorithmic thinking, programming in Scratch, Raspberry Pi, Alice and Java, and in the use of virtual worlds) using the Bridge21 model of collaborative technology mediated learning. 1000 Raspberry PI devices will be supplied to participating schools and the initiative includes a national computer programming competition. There will be particular support for schools in disadvantaged areas. For more info see bridge21.ie. "Last week at a special event at Bridge 21 at Trinity College in Dublin, Puttnam urged Ireland to consider an awards scheme like the National Teaching Awards to publicly acknowledge good teaching practices and achievements. He also said the media in Ireland should be more supportive of the need to reinvigorate Ireland's education system and push for the deployment of 21st-century technology and learning practices in schools." CRITE in partnership with the Trinity Access Programmes and Suas Educational Development have for 3 years been running a successful computer mediated outreach activity known as the Bridge to College, involving intensive team oriented project based learning workshops, targeted at transition year students from schools with a low transfer to 3rd level education. In December 2010 John Lawlor received a highly competitive Soical Impact Award from Social Entrepuners Ireland for his work on the project.